Currently, Dr. Shuman is primarily working on in situ, satellite, and modeled temperature data sets from Greenland in collaboration with other researchers at NASA GSFC. Previously, he has authored or co-authored research papers on ice elevation changes and glacier mass losses using altimetry in combination with other remote sensing in the Antarctica Peninsula, on the accuracy of the first ICESat mission’s data over Antarctica’s large subglacial lakes. He has also worked on composite temperature records derived from automatic weather stations (AWS), passive microwave data from SMMR and SSM/I and IR data from AVHRR satellite sensors. In addition, Dr. Shuman has successfully matched those records through stratigraphic correlation with stable isotope temperature proxy profiles in shallow snow layers. He has worked extensively in Greenland (7 deployments) and Antarctica (6 field deployments plus more recent Operation Ice Bridge flights from Punta Arenas, Chile). He began his cryospheric career helping to date the 3054 m long Greenland Ice Sheet Project 2’s (GISP2) deep ice core in 1992. He was the longest serving member of the Polar DAAC Advisory Group (PoDAG) and also served on the Center for Remote Sensing of Ice Sheets (CReSIS) advisory board and is also on the Executive Committee of the Cryospheric Focus Group of AGU. Dr. Christopher Shuman presented ongoing change studies from the Antarctic Peninsula at the Spring Research Forum. Dr. Christopher A. Shuman is a Research Scientist within the Cryospheric Sciences Laboratory at NASA Goddard Space Flight Center (GSFC). He has been employed by the University of Maryland, Baltimore County’s (UMBC’s) Joint Center for Earth Systems Technology (JCET) since 2011. Before joining JCET, he was with UMBC’s Goddard Earth Sciences & Technology Center for four years. In 2014, he became affiliated with UMBC’s Geography and Environmental Systems Department as an Research Associate Professor. 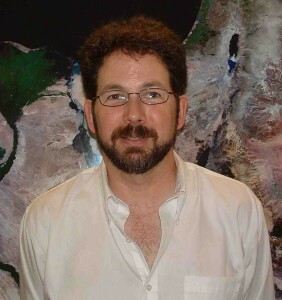 From 2001-2007, Dr. Shuman was a Physical Scientist with the Cryospheric Sciences Branch (now Laboratory) at GSFC, and the Deputy Project Scientist for the Ice, Cloud, and land Elevation Satellite (ICESat) Mission from 2001 to 2005, as well as an Adjunct Research Faculty at the Earth System Science Interdisciplinary Center (ESSIC) at University of Maryland, College Park. From 1999-2001, Dr. Shuman was an Assistant Research Scientist at ESSIC. From 1996-1998, he was a Visiting Research Fellow with the Universities Space Research Association at GSFC’s Oceans and Ice Branch working with Dr. Robert A. Bindschadler. From 1994-1996, he was a National Research Council, Resident Research Associate at GSFC’s Oceans and Ice Branch, Greenbelt, MD working with Dr. Robert A. Bindschadler. From 1992-1994, he was a Research Associate at the Earth System Science Center and Department of Geosciences of The Pennsylvania State University, working with Dr. Richard B. Alley. Dr. Shuman received his Ph.D. in Geosciences in 1992 and his M.S. in Geology in 1987 from The Pennsylvania State University, and his B.S. in Geology in 1982 from Moravian College. Scambos, T.A., E. Berthier, T. Haran, C.A. Shuman, A.J. Cook, S.R.M. Ligtenberg, and J. Bohlander, 2014. Detailed ice loss pattern in the northern Antarctic Peninsula: widespread decline driven by ice front retreats, The Cryosphere, vol. 8, pp. 2135-2145, doi: 10.5194/tc-8-2135-2014. Shuman, C.A., D.K. Hall, N.E. DiGirolamo, T.K. Mefford, and M.J. Schnaubelt, 2014. Comparison of near-surface air temperatures and MODIS ice-surface temperatures at Summit, Greenland (2008-2013), Journal of Applied Meteorology and Climatology, vol. 53, no. 9, pp 2171-2180, doi:10.1175/JAMC-D-14-0023.1. Häkkinen, S., D.K. Hall, C.A. Shuman, D.L. Worthen, and N.E. DiGirolamo (2014). Greenland ice sheet melt from MODIS and associated atmospheric variability, Geophysical Research Letters, 41, 5, 1600-1607, doi:10.1002/2013GL059185. Kawamura, K., J.P. Severinghaus, M.R. Albert, Z.R. Courville, M.A. Fahnestock, T. Scambos, E. Shields, and C.A. Shuman (2013). Kinetic fractionation of gases by deep air convection in polar firn, Atmospheric Chemistry and Physics, 13, 7021-7059, doi:10.5194/acpd-13-7021-2013. Hanna, E., X. Fettweis, S. H. Mernild, J. Cappelen, M. H. Ribergaard, C.A. Shuman, K. Steffen, L. Wood, and T.L. Mote (2013). Atmospheric and oceanic climate forcing of the exceptional Greenland ice sheet surface melt in summer 2012, International Journal of Climatology, 34, 4, 1022–1037, doi:10.1002/joc.3743. Hall, D.K., J.C. Comiso, N.E. DiGirolamo, C.A. Shuman, J.E. Box, L.S. Koenig (2013). Variability in the surface temperature and melt extent of the Greenland ice sheet from MODIS, Geophysical Research Letters, 40, 10, 2114–2120, doi:10.1002/grl.50240. Rennermalm, Å., S. Moustafa, J. Mioduszewski, V. Chu, R. Forster, B. Hagedorn, J. Harper, T. Mote, D. Robinson, C.A. Shuman, L. Smith, and M. Tedesco (2013). Understanding Greenland ice sheet hydrology using an integrated multi-scale approach. Environmental Research Letters, 8 (1)015017 doi:10.1088/1748-9326/8/1/015017. Nghiem, S.V., D.K. Hall, T.L. Mote, M. Tedesco, M.R. Albert, K. Keegan, C.A. Shuman, N.E. DiGirolamo, and G. Neumann (2012). The extreme melt across the Greenland ice sheet in 2012, Geophysical Research Letters, 39, L20502, doi:10.1029/2012GL053611. Hall, D.K., J.C. Comiso, N.E. DiGirolamo, C.A. Shuman, J.R. Key, L.S. Koenig, (2012). A satellite-derived climate-quality data record of the clear-sky surface temperature of the Greenland Ice Sheet, Journal of Climate, 25, 4785–4798, doi:10.1175/JCLI-D-11-00365.1. Berthier, E., T. A. Scambos, and C.A. Shuman (2012), Mass loss of Larsen B tributary glaciers (Antarctic Peninsula) unabated since 2002, Geophysical Research Letters, 39, L13501, doi:10.1029/2012GL051755. Shuman, C.A., E. Berthier and T. Scambos, (2011). 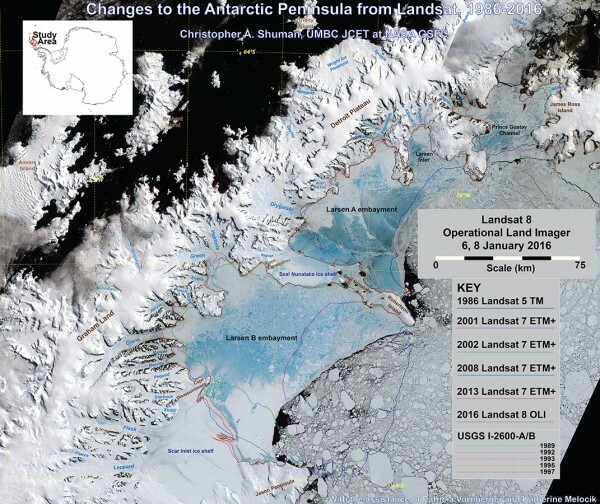 2001-2009 elevation and mass losses in the Larsen A and B embayments, Antarctic Peninsula. Journal of Glaciology, 57(204), pp.737-754, doi:10.3189/002214311797409811. Scambos, T.A., E. Berthier and C.A. Shuman (2011). The triggering of sub-glacial lake drainage during the rapid glacier drawdown: Crane Glacier, Antarctic Peninsula. Annals of Glaciology, 52(59), pp.74-82, doi:10.3189/172756411799096204. A more in depth list of Dr. Shuman’s publications appears here.